The Standards Organisation of Nigeria (SON) has expressed its willingness to collaborate with Dolby Laboratory Incorporated of the USA in ensuring adherence to audio and sound technology standards in Nigeria in furtherance of its mandate to promote standardization in all sectors in the Country. Director, DG’s Office, Barr. Richard Agu stated this while receiving some Executives of Dolby Laboratory Incorporated on behalf of the Director General, Osita Aboloma Esq. at the SON Corporate Headquarters, Abuja recently. According to him, such collaboration aimed among others at curbing the menace of counterfeiting of audio and sound products and materials is welcome by the SON, particularly in view of the impending digital switch over programme for broadcasting in Nigeria. Leader of the Dolby team, Mrs. Vivian Vasallo, Senior Director, Intellectual Property Protection and Enforcement, said the visit was in furtherance of the company’s expansion of its presence in Africa with regard to the creation of audio and voice technologies for cinemas/movies, home theaters, personal computers, mobile devices and games. The company according to her already has presence in South Africa and Kenya. Vassalo stated that the planned switch over from analogue to digital broadcast band in Nigeria provides great opportunities in audio investment but noted that the danger of counterfeiting of audio and sound technology materials are also real given the expansive nature of the Nigerian market occasioned by its large population. – Capacity development and provision of tools to identify counterfeits and infringements on audio and sound products, standardization and intellectual properties protection. 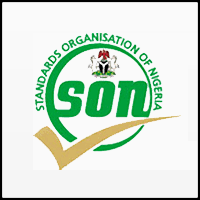 – To explore areas of support to SON Staff in enforcement infractions of audio and sound technology standards in Nigeria. Barr. Agu referred the Dolby Team to the Nigerian Copy Right Commission and Trade Mark Department of the Federal Ministry of Industry, Trade and Investment on issues of intellectual property rights protection and trademark infringement, stressing that SON’s mandate covers standardization and quality assurance including testing and measurements. Other participants at the meeting included, Acting Director Operations, Mr. Dauda Yakubu, Deputy Director Operations, Dr. Bartholomew Ugwu and Special Assistant to DG and Head, Public Relations, Mr. Bola Fashina, while Messrs. Jieun. Kim, Senior Manager, Dolby Laboratories International Services Incorporated, South Korea and Mr. Enoch Hwande, Chief Executive of Allvirtuous Incorporated accompanied the Dolby Team Leader.